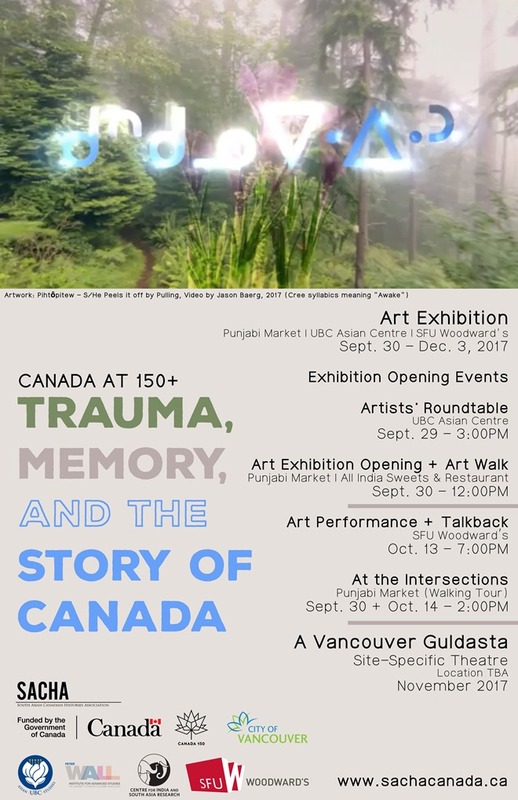 Visit the art exhibition “Canada at 150+: Trauma, Memory and the Story of Canada” presented by the South Asian Canadian Histories Association from now until early December at UBC, and in the Punjabi Market (6500 block of Main Street, Vancouver). Two works for the exhibition will be on view at the Asian Centre foyer and the upper floor of the Asian Library: Pouf, Sausage, Weight, Arc (2017) by Sameer Farooq and How This Will End (2017) by Umesh M.S. Other artists taking part in this exhibition include Vikky Alexander, Sonny Assu, Jason Baerg, and Hyung-Min Yoon. For more information, please visit the SACHA website at https://sachacanada.ca/. Chan was awarded Bachelor Degree of Fine Arts by Concordia University (Canada) and Master Degree of Fine Art by Royal Melbourne Institute of Technology University (Australia) in 1985 and 2006. Honored with Chinese ink painting prizes by Taipei Fine Arts Museum, Beijing International Ink & Wash Painting Institute and Foreign Culture Exchange Association of China, etc., his works are now in the collections of museums and art institutes both in Hong Kong and overseas. At present, Chan is a member of Consulting Committee of Federation of International Tsai-Mo Artists, Honorary President of Hong Kong Modern Ink Painting Society, Consultant of Art of Creative Painting Association, and Modern Ink Painting part-time instructor at the Chinese University of Hong Kong. 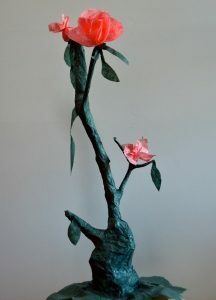 Born in Hong Kong in 1939, Suen was raised in a traditional Chinese family and has great passion for art and painting. In 1968, she learnt her foundation skills in Chinese painting in New Asia College with Professors such as Johnson Su-sing Chow. After residing in Canada in 1974, she continued her pursuit on Chinese painting and calligraphy with various distinguished teachers. 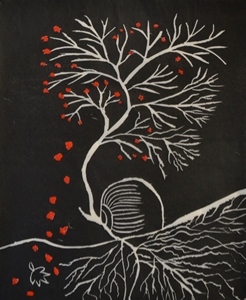 Suen is currently a member of Chinese Canadian Artist Federation in Vancouver. She participated Vancouver’s Chinese Painting Annual Exhibition for many years. After publishing her personal art collection in 2012, she held her first solo exhibition in Hong Kong the same year and in Burnaby (Canada) in 2013; and in joint exhibitions every year till 2016. Li, aged 72, who was born in Beijing, is a writer, collector and calligrapher. He is also a researcher of the Cultural Regeneration Research Society. 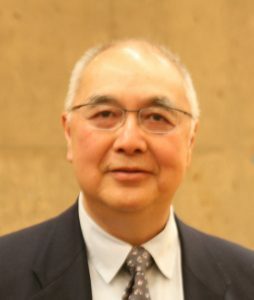 He is expertized in oriental folklore studies and has published over 20 books in Canada, Japan, Taiwan and China. Apart from researches, he practices as an instructor of calligraphy among the Chinese community centers for over 10 years where he had taught a bunch of students with flying colors, He also teaches in Richmond Arts Centre and CCM Canada. Li is famous for the calligraphy of zhuan (篆 ) and li (隸). 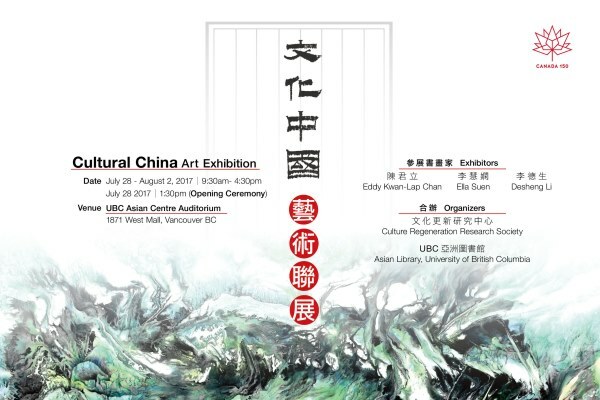 To view some of the artworks and find out more information about this exhibit in Chinese, please visit the CRRS website. Come and visit the new exhibit Jayeonmi (Natural Beauty) by local artist Ilsoo Kyung at the Asian Centre foyer. Ilsoo was born in Korea and immigrated to Canada in 1967. 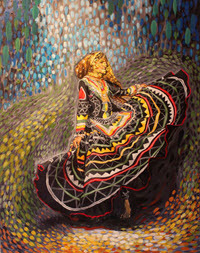 She began to paint in 1998. 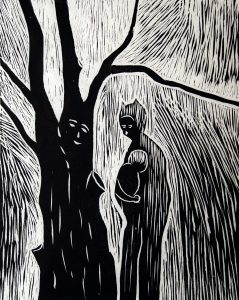 After retiring from her nursing career in 2002, Ilsoo continued her studies at UBC and received a bachelor’s degree in Art History, Visual Art and Theory, as well as an art teacher’s diploma in 2006. Many of her works are included in private collections in Korea, Australia, the United States and Canada. 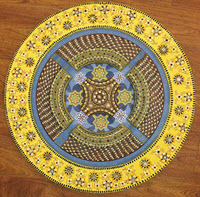 Ilsoo is a multimedia artist who has been involved in numerous solo and group exhibitions. Her works involves personal identity and expression, as well as themes within the context of Korea and Canada. In recent work she has been addressing the question of cultural identity and in this process a new synthesis is emerging in her own individual disciplines, which include painting, sculpture, printmaking, video and digital imagery, performance art and installation works. Ilsoo’s works are grounded in the natural world, but she looks beyond the scenic to search for symbols and meaning in all that she encounters. Her style is representational, with special attention to colour, texture and form. Ilsoo has been featured in a number of media, including Senior Living Magazine, CHEK TV and YouTube. Please click here for the Artist Statement.